Campaigners are fighting plans to build houses on the Hoo peninsula. 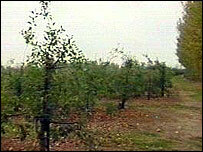 An application for more than 500 homes on an orchard in Hoo St Werburgh, Kent, has already been submitted. Hands Off Kent say they there are plans for 1,000 new homes in the Medway local plan. They fear another 5,000 homes are to be built at Chattenden Barracks. But Medway Council has said the figure is incorrect with 558 homes planned at the Bells Lane orchard and "no more than 5,000" at Chattenden. About 200 people attended a meeting in Hoo on Friday to plan their next action in the opposition campaign. Ann Parker, spokeswoman for Hands Off Kent, said: "It's just eating away, gradually and insidiously at our greenfield sites and it won't stop there. "Once these are lost, sights are set on the next bit and the next bit and we already know there is a plan for future development which is actually on the field next to the orchard." Campaigners say they want to see new houses built on former industrial land before greenfield sites. The public meeting was run by the Association of Hoo Residents, Hoo Parish Council and Hands Off Kent. But Medway Council spokesman said: "The figure of 7,000 houses is incorrect." He said the Medway Local Plan envisaged up to 558 houses to the east of Bells Lane, Hoo. He added: "Subject to the Ministry of Defence releasing land at Chattenden Barracks and Lodge Hill training areas, then a new free-standing settlement would comprise no more than 5,000 houses and would take over 20 years to complete. "If the new settlement goes ahead, it would be completely self-contained and not be visible from the wider area. "It would only involve land which is not currently accessible to the public, with the aim of creating a fully sustainable community with its own services and employment opportunities." A brown future for UK housing?